Hamid is an internationally acclaimed Manufacturing Leader with a wide-ranging experience base in the Automotive and Aerospace Sectors. He joined Rolls-Royce in 2001 from BMW Group where he was Director of New Product Programmes. 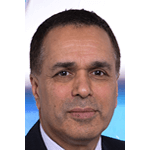 In his current role as Director of Manufacturing, Rolls-Royce plc, Hamid is responsible for leading the Manufacturing strategies, partnerships and activities across the company’s Civil, Defence, Marine & Power System businesses.